The object of this work is to implement an epidemic model for predicting the air-borne transmission of foot-and-mouth disease (FMD)-viruses. In case of an epidemic it is possible to support veterinary agencies in controling and combating the disease. The major tool of the decision-support-system is the so-called Gaussian dispersion model to calculate virus plumes. The input information are a veterinary database of geo-referenced premises of a Geographical Information System (GIS) and meteorological parameters temperature, relativ humidity, precipitation, cloud coverage as well as wind speed and wind direction. The meteorological parameters are given by the Limited Area model (LM) from the German Weather Service (DWD). During the PICORNA04 FMD-exercise, enjoined by the EU, the application of the decision-support-system was demonstrated. This exercise took place in Austria between November 8. and 11. 2004. For this first application it was assumed that animals of a farm in Styria (Hartberg, 10 cattle and 1 pig) and in Burgenland (Güssing, 0 cattle and 10 pigs) were infected by the FMD-virus. Within a 3 km control zone the calculated areas under risk were displayed for different species. Orthophotos were laid under the plumes. Because of the low virus concentration, which is required to infect cattle, special attention was given to this species. A decision-support system for real-time risk assessment of airborne spread of foot-and-mouth disease virus. Methods of Information in Medicine, 44, 590-595. The spread of Foot-and-Mouth Disease (FMD) virus via the atmosphere (in German). Master Thesis, Department für Naturwissenschaften und Mathematik der Universität Wien, 95pp. Comparable application of the Gaussian dispersion and the Lagrangian particle model to the spread of virus (in German). Master Thesis, Fäkultat für Geowissenschaften, Geographie und Astronomie der Universität Wien, 91pp. 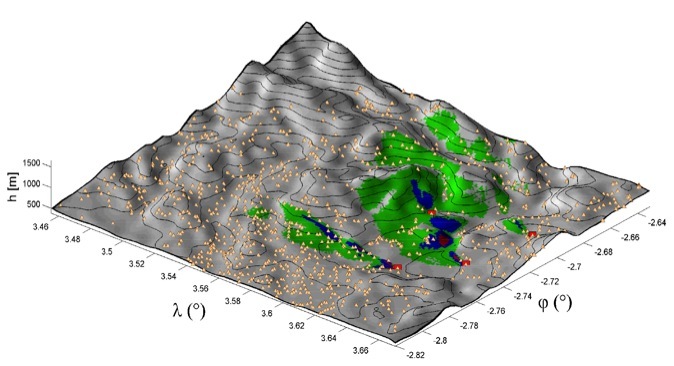 Airborne spread of bioaerosols in the boundary layer over a complex terrain is simulated using a Lagrangian particle model, and applied to modelling the airborne spread of foot-and-mouth disease (FMD) virus. Two case studies are made with study domains located in a hilly region in the northwest of the Styrian capital Graz, the second largest town in Austria. Mountainous terrain as well as inhomogeneous and time varying meteorological conditions prevent from application of so far used Gaussian dispersion models, while the proposed model can handle these realistically. In the model, trajectories of several thousands of particles are computed and the distribution of virus concentration near the ground is calculated. This allows to assess risk of infection areas with respect to animal species of interest, such as cattle, swine or sheep. Meteorological input data like wind field and other variables necessary to compute turbulence were taken from the new pre-operational version of the non-hydrostatic numerical weather prediction model LMK (Lokal-Modell-Kürzestfrist) running at the German weather service DWD (Deutscher Wetterdienst). The LMK model provides meteorological parameters with a spatial resolution of about 2.8 km. To account for the spatial resolution of 400 m used by the Lagrangian particle model, the initial wind field is interpolated upon the finer grid by a mass consistent interpolation method. Case studies depict a significant influence of local wind systems on the spread of virus. Higher virus concentrations at the upwind side of the hills and marginal concentrations in the lee are well observable, as well as canalization effects by valleys. The study demonstrates that the Lagrangian particle model is an appropriate tool for risk assessment of airborne spread of virus by taking into account the realistic orographic and meteorological conditions. Animated FMD virus plumes. Red squares indicate for the positions of infected farms, brown points for the more than 1000 susceptible farms in the 25 km x 25 km model domain. Yellow particles are located in the lowest 10 m above ground. Green, cyan, blue, magenta and black points mark viruses at higher vertical layers (upper panel). Risk areas for cattle (green), sheep (blue) and swine (red) based on critical FMD virus concentrations (lower panel). A Lagrangian particle model to predict the airborne spread of foot-and-mouth disease virus. Atm. Environm., 42, pp. 466-479. This research was supported by research Grant PP 1500 0007 of the University of Veterinary Medicine Vienna. The German weather service (DWD) provided the meteorological input data for the case studies. We thank Udo Voigt (DWD) for assistance with data transfer and Dr Michael Baldauf (DWD) for interpreting NWP model output.